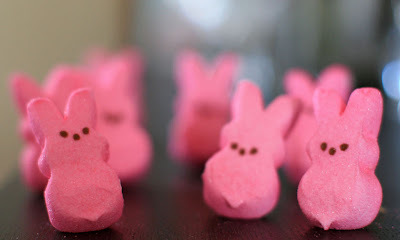 The Blog of CF Photography: Happy Peepster! 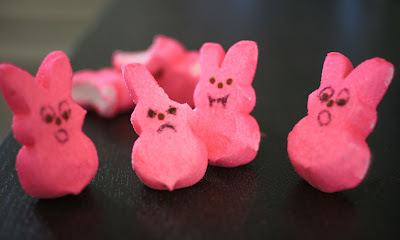 Some times my love of peeps goes to far and this is no exception. You are all lucky that I didn't have more free time to really go crazy (I had bought chicks as well). 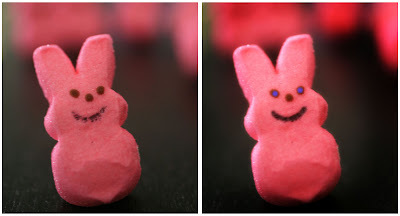 This is what happens when you turn your back on a peep. you never know what can happen! Note the carnage in the background as well. Some of you say "I would love to see before and after images from a portrait session". Well this is Mrs.Bunn and we cleaned up her smile, made her eyes pop, a small amount of vignette and gave a bit of glamour glow. I think she looks simply stunning.